View cart “Issue 26 (February 2015)” has been added to your cart. 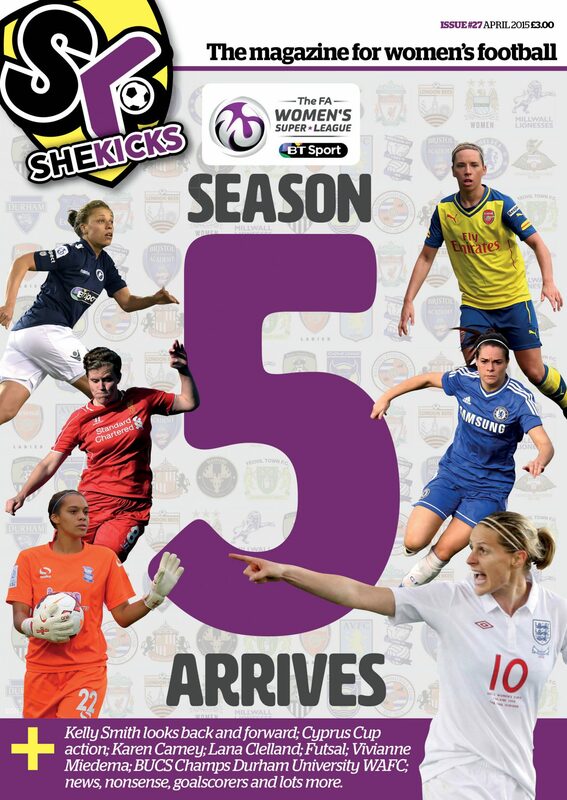 The 2015 FA WSL and SWPL seasons are here…and so is the latest issue of SHE KICKS. ISSUE 27 is 64 pages of women’s footie words, pictures and paper, all bundled together with love, enthusiasm and quite a lot of caffeine. We pay tribute to Kelly Smith, speak to an array of WSL players about the season ahead and chat to Karen Carney about her musical tastes. Dutch striking starlet Vivianne Miedema; Scotland’s Italy-based Lana Clelland, some fun info about world cup city Moncton (where England will be based) and Wales’ new FIFA referee Charlotte Carpenter give us a ‘cosmopolitan’ feel, along with reaction from the 2015 Cyprus Cup.